The awesome Juan Opening Hands Cartoon for PowerPoint is useful presentation for multiple purposes. For example, educational seminars, training guides and discussions at work or schools. The Juan cartoon character clipart template illustrates a man with casual look and open arms. The hand gestures and body language is helpful in demonstrating different topics and ideas. For example, the company can use this cartoon PowerPoint in orientation meeting presentation. This way, the new employees can get comfortable with the formal introduction and feel welcomed into the organization. The Juan cartoon character add a little humor to the presentation which can aid in smooth audience interaction. The Juan cartoon clipart illustrates a happy person and open hands. 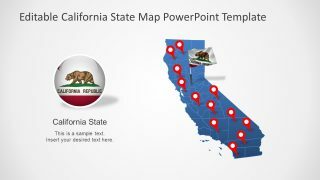 Therefore, the clipart image can visually support a joke or comical event during presentation. 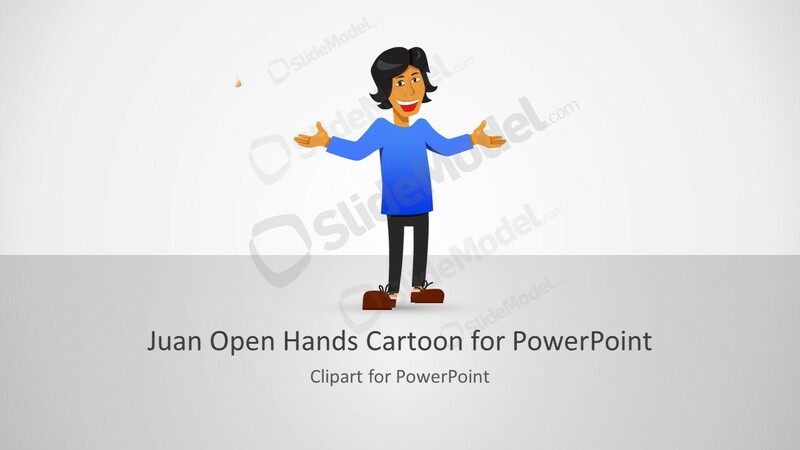 The Juan Opening Hands Cartoon for PowerPoint shows a man appear casual, yet presentable. The open arms gesture gives the impression of being welcoming, greetings or accommodating characteristics. 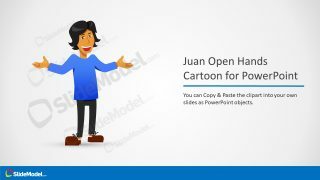 The PowerPoint template of Juan cartoon has 4 creative slides with different layout designs. The editable template of Juan cartoon contains two contents layouts. These layout slides display various presentation and customization suggestions. 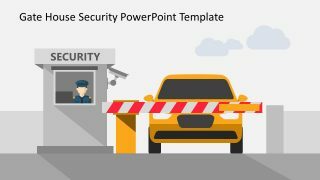 For instance, the third and fourth slide of PowerPoint have circular infographic icons as bullet lists. These icons list down the options like resize, customize, shape effects, copy paste and more. 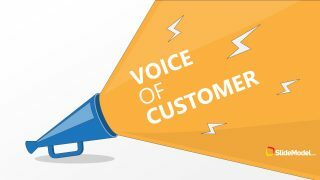 Therefore, the slides assist users to personalize the template according to their needs or requirements. 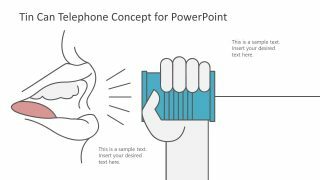 The clipart template of Juan cartoon opening hands is a creative PowerPoint of flat vector design powerful visuals. 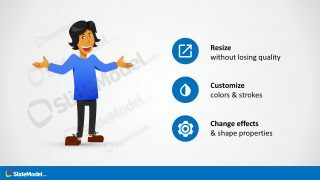 The figure of Juan cartoon is comprising of layer of PowerPoint shapes in a group. Hence, it is easier to make design customizations like changing colors, rescaling and rotating shapes to adjust etc. 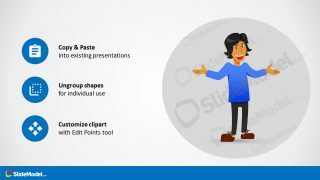 Further, the SlideModel has similar cartoon templates like Juan presenting PowerPoint for downloading and reusing for multiple purposes.